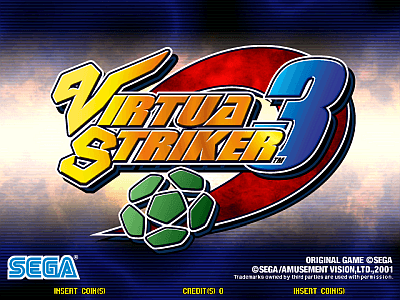 Virtua Striker 3 © 2001 Sega Enterprises, Limited. 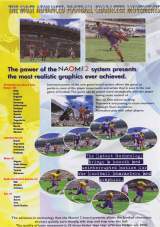 Runs on the Sega "NAOMI 2" hardware. 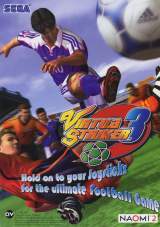 Virtua Striker was released in July 2001. It was the game was presented at the February 2001 AOU (Arcade Operators Union) show in Japan. * Ranking Mode : After putting in the token, push the joystick down (hold it there) and press the start button. * Play against FC SONIC : You must play up to the final match and win the final match. After which there will be a congratulation screen showing your team photo. Do the following steps while still in the congratulation screen: -> press short pass three times, followed by pressing shoot button once and press short pass once again. You will then challenge FC SONIC instead of FC SEGA. * F.C. Sega : To play as F.C. Sega, you have to press the start button once over each of the country below in the following numerical order. After doing so, there will be a new F.C. Sega team option at the top centre of the team selection. * F.C Sonic : To use F.C Sonic, go to the following countries in the order and press start once. Choose only one team per letter. i.e Sweden, Morocco, Denmark, Spain, France (The 1st, 2nd, 3rd, 4th, 5th letters of the above teams form the words SONIC). A box will appear above Italy. Note : This code will only work if F.C Sonic has been challenged during Special Match.